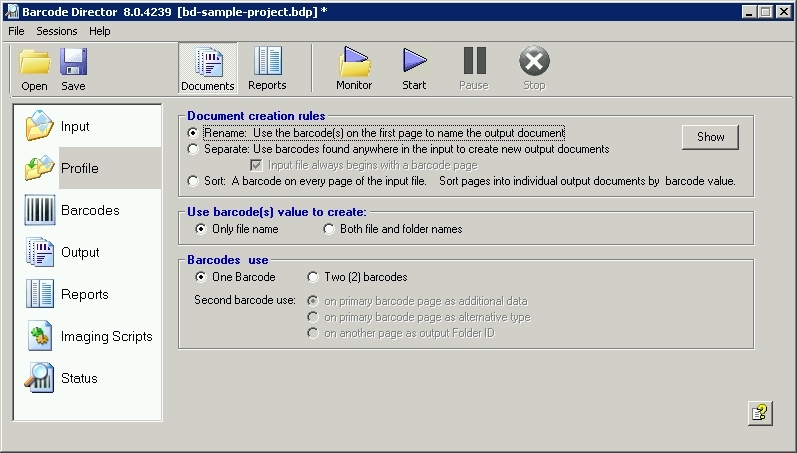 Barcode Director is a volume production application that renames documents, sorts documents, splits documents based on the barcode values . Ready to run, the application operates on PDF, TIFF, JPEG, PNG and many other types of files. 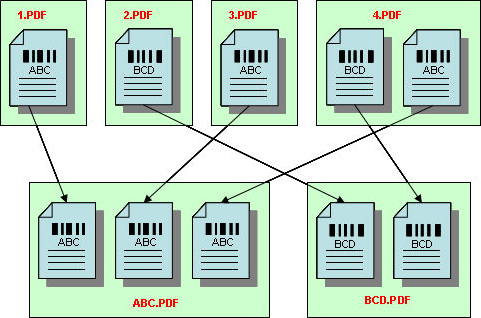 Automate the processing of files that come to you from fax, e-mail, paper scanning or document production. Read the barcodes on the cover pages or on any inside page, in any orientation. 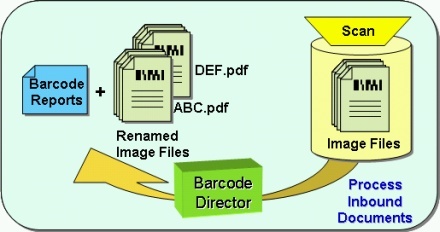 Barcode Director can transform any image format into PDF files. Poor quality images are automatically analyzed, and the appropriate repair scripts are applied to improve the barcode recognition rate . Best of all, the power of Barcode Director is made available through a simple, intuitive user interface leads you through the sequence of steps to set up the workflow . Click on screenshots below to see the steps in more detail . JPEG, PNG, GIF, BMP, etc. 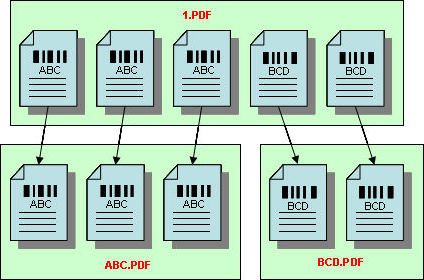 Rename document using first (cover) page barcodes. Reporting only mode: read all pages in all files and report the barcode values. 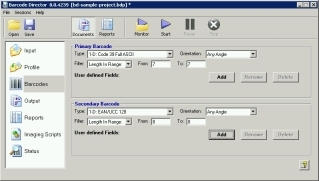 Profiles define how input documents are converted to output documents. There are three major profiles: rename, separate and sort. Each of them has sub-profiles that deal special requirements of user environment, e.g. use of secondary barcodes, deleting of cover/separator pages, handling exceptions, using barcode substring, etc. 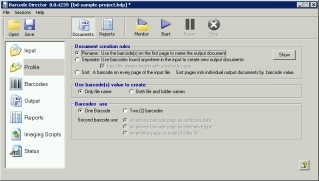 This profile names the output document by examining the barcode value only on the FIRST page of the input file. Barcodes on all other pages are ignored. 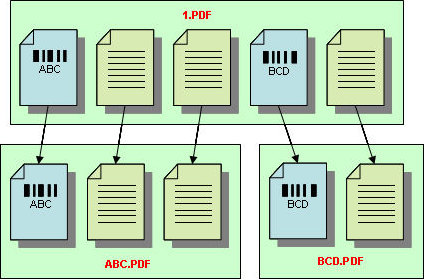 In all other respects the input file and the output file are identical. 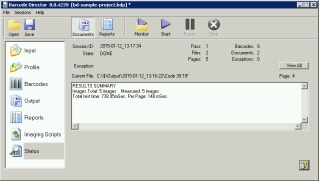 Output document spans multiple input files. 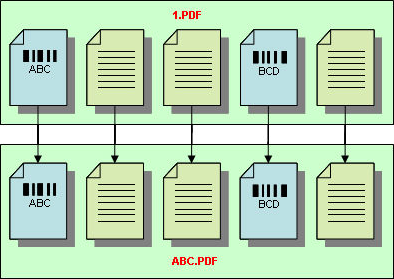 For example while faxing large document transmission is interrupted, then resumed from the next pages that is not faxed yet. 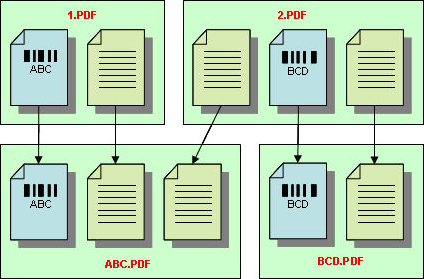 If second document has no barcode, then in effect two input documents will be combined. 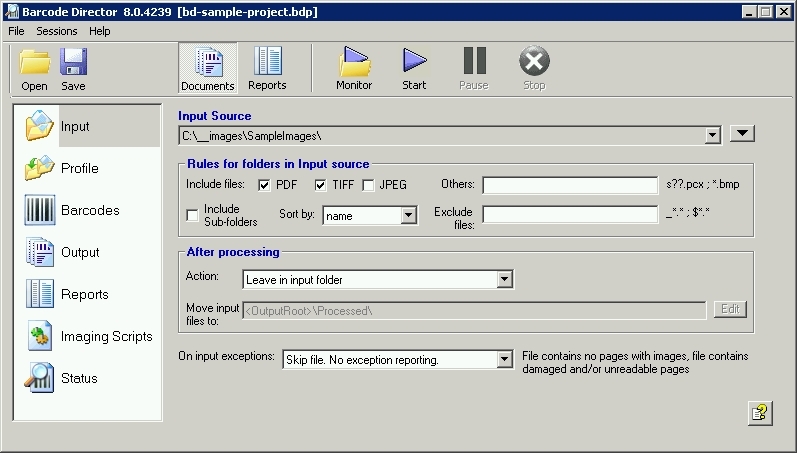 Output document pages come from multiple input files. 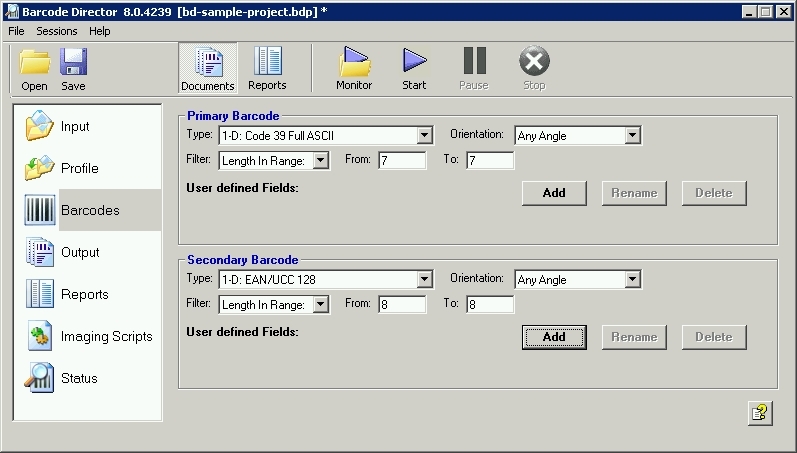 This profile create reports in XML, CSV or DAT formats with barcode values and properties. 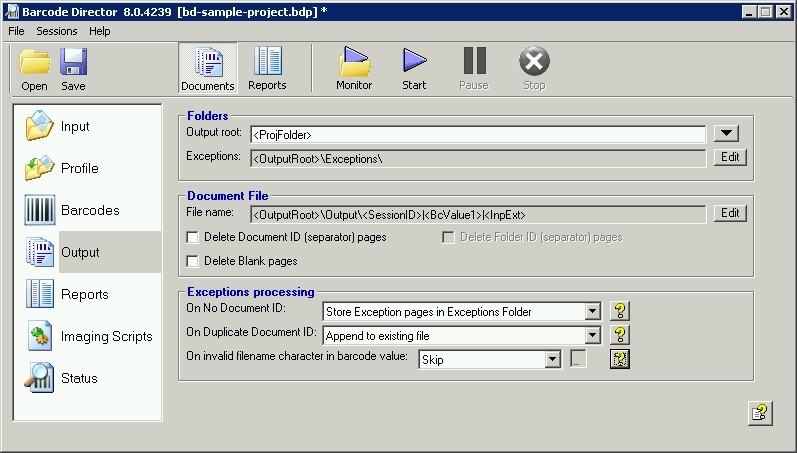 Unlike above profiles no output image documents are created. 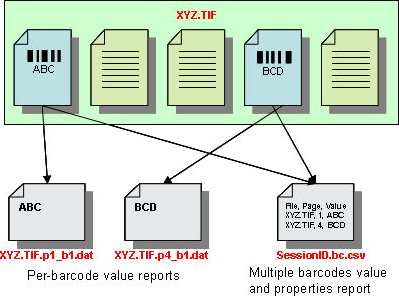 However values multiple barcode types, including large binary data from 2D barcodes, can be collected in a single session. 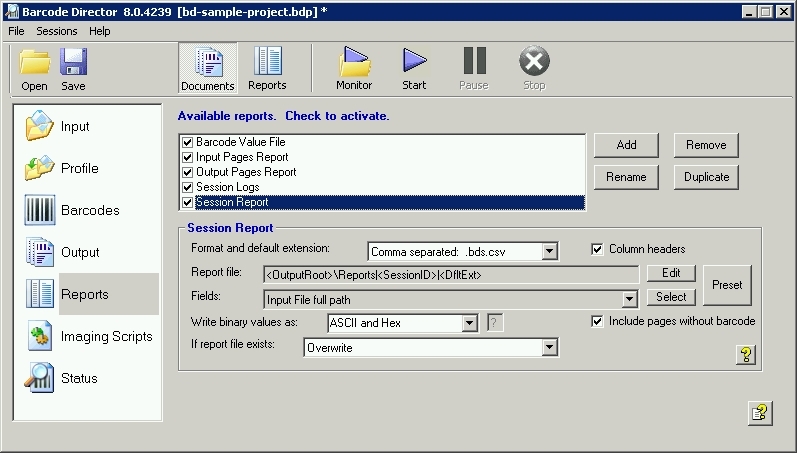 Types, number and format of reports are matched to user's workflow requirements. 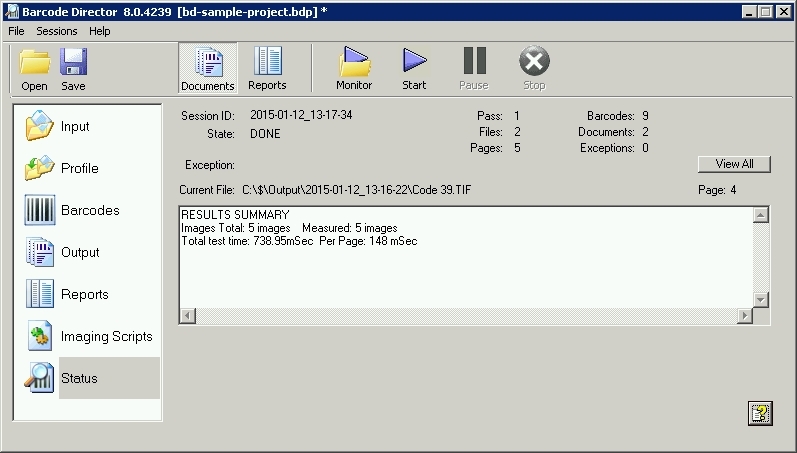 NOTE: Profiles that create image documents produce extensive reports as well. Reports document source and destination of all processed pages. Please read the license requirements and purchase details below. Licenses are perpetual and never expire. each instance of virtual machine, and each cloud VM instance. The number of users, images or cores are not limited by the license. Unless otherwise arranged with Inlite, the licenses are perpetual and the fees are paid one time in advance. The license includes support and software updates for one (1) year. Support for additional years is available. All prices are shown in US$. The shopping cart will show prices in your local currency. Prices are subject to change without notice. Inlite uses Digital River services to operate the shopping cart and process CREDIT CARD purchases only. Digital River collects VAT and sales taxes. Use the links on your confirmation email to contact them, or to obtain copies of the receipts.